Inner Beauty Part 1: Judging it. – God is Amazing! Outer beauty is something the world around us obsesses with. It is difficult to truly see what God wants us to see. I know you have probably heard this before, but It is more important to be pretty on the inside than it is on the outside. 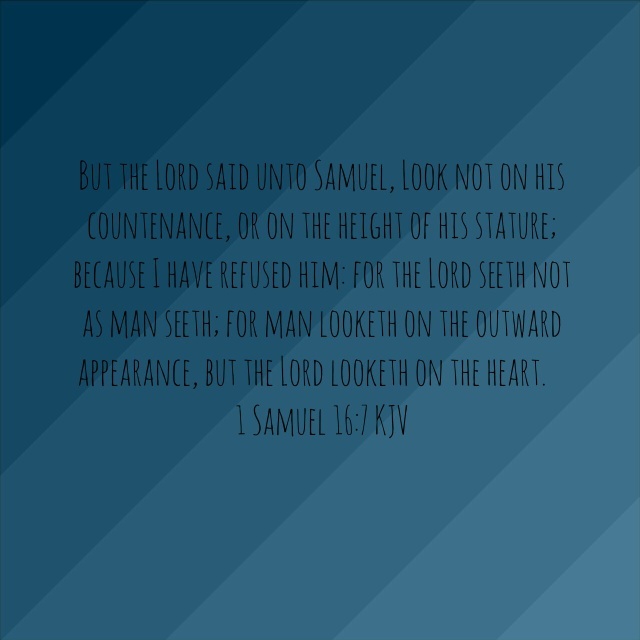 1 Samuel 16:7 tells us to not look at peoples status or appearance. Every Christian struggles with this, God was right when He said, “Man does not see what the LORD sees, for man sees what is visible, but the LORD sees the heart.” Man does tend to focus on what we can see with our eyes, and that right there is half the problem. When we look at someone, we immediately start putting him or her in a category: Rich, poor, decent, indecent, proud, confident, nervous, pretty, ugly, etc. The list goes on and on and on. If we can stop ourselves the next time we see somebody we don’t know, stop and think, “I don’t know what is going on in their life, I have no right to say if they are pretty or not. ” Then we will be off to a good start. If we can make a habit of not judging people, then we are doing really, really good. Please help me to leave the judging to You. You are the only one who has the right to judge somebody, and yet I take it into my own hands all the time. Please help me to break that habit. Thank you for all You have blessed me with. Nice job! Hi everyone this is Elise, AKA, Aubrey’s sister. I know her and she is amazing, I love her so much! She has helped me so much to know God, our good Lord! I hope she helps you get to know God, like she has helped me! Hey Elise! Thank you for your kind words on Inner Beauty Part 1! God is good and I am thankful for you in my life! You are a blessing and you are amazing! I love you! God loves you so much!